Aries Energy: Jumpstart Your "Spring Cleaning for the Soul"
Aries energy comes at the beginning of spring, making it a great time to clean up your life—including your soul. Find out how when Anne returns to Frank Fontana’s “Design Dude” show this Saturday, April 5. 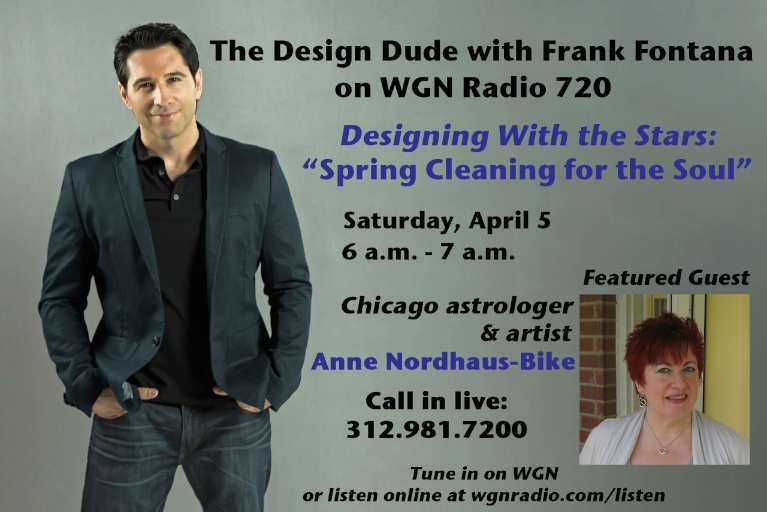 Get tips on how astrology can help you de-clutter YOUR soul by tuning in to WGN Radio AM 720 Chicago—online or on your radio—on Saturday, April 5, from 6 a.m. to 7 a.m.
During the popular “Designing With The Stars” segment on Fontana’s top-rated show, you’ll hear design guru Frank Fontana tap Anne’s spirituality expertise about the astrological new year, how to harness the magnificent power of Aries, and why it’s easier to “clean up your act” on all planes in springtime. Or listen online from anywhere in the world by going to http://wgnradio.com/listen/. Or listen on your smartphone or other mobile device with the WGN Radio app, available for both Android and Apple devices; to get the app, go to http://wgnradio.com/listen/ and choose the link for your device.